Last Week – We visited Wakefield with a run up to Lake Quannapowitt. Some runners training for a half made their way up to the lake and looped around to get their miles in. Others tacked on some extra by looping the lake before heading back to Melrose. The marathon training runners looped the lake and then headed over to Breakheart for a run around the outer loop before heading back to Main Street in Wakefield to finish up. The water stop stood at Nick’s for the whole run, with Hank, Tom, and Audrey providing top notch service the whole morning… which allowed me to joined in on the Sunday Long Run for the first time in a long time. I joined Jen Elise, Lois, and Yvonne for a loop around the Lake and then set off solo to make the loop of Breakheart. It was good seeing Mike Sikkema and Dave Corbett effortless speed by. I found Andy Nagelin going rogue, looping the outerloop the opposite way around. I had forgotten how tough the Breakheart hills are, but I didn’t walk, and I hear neither did Regina! And I was reminded of how long a mile Nahant is when it gets hot. It was good to be back on the roads with the SLR, even for only 9+ miles of it. This Week – We keep increasing the mileage as we work up to the peak next week. Changing the routes up a tiny bit, we’ll head over to the peaceful Swain’s Pond area of Melrose before cutting over to the Fells and around to Breakheart again. Sort of the Emerald Necklace of Melrose. Start – Crossing Main Street, we’ll start from outside of the Melrose YMCA. Head up East Foster for a hill right away, turning right onto 6th Street at the Melrose Common. 6th will become Swain’s Pond Ave, taking you up to Turners Pond and Swain’s Pond. Take a right at the stop sign at the ponds to stay on Swain’s Pond Ave. You’ll come to Lebanon St where you have to turn right. Over the years there have been many that have zoned out and continued on Lebanon Street the wrong way… they’re still wandering Malden somewhere. But you’ll turn right there and come to a set of lights where you turn left off Lebanon on to Forest Street. Run past the Forest Dale Cemetery to the end of Forest where you’ll cross Main and find a water stop in the parking lot of the Citizens Bank. Half/Full 2 – All runners will leave the parking lot onto Winter Street, running over the Oak Grove stop on the Orange Line to a 5 way intersection. Go straight across onto Glenwood Street. Follow this windy hilly road to Highland Ave, take a right and an immediate right to get onto the Fellsway East. Run over those familiar hills up past Grimsby’s and onto the LynnFells Parkway. Some more familiar hills will take you to Melrose High School, where there will be a water stop at the Knoll on your right. Half Finish – Everyone will continue on the LynnFells Parkway into Saugus. The half runners will turn left onto Main Street in Saugus and turn left again on to Howard Street. Howard will bring you down to Green Street where you’ll go left, cross the LynnFells Parkway and merge onto Main Street. Pass Ell Pond and make your way into Melrose Center to finish up 11 miles. If you’re looking to stretch your half training miles you can turn onto the LynnFells Parkway past the high school, grab a little more water and make your way to Grimsby’s to Wyoming to Main for an extra mile. Full 3 – Long runners will keep straight on the LynnFells until they get to the Saugus entrance to Breakheart where you’ll head up to the headquarters parking lot for a water stop. Full 4 – Run the outer loop and come back to the water stop. If you don’t know how to do that correctly by now… you’re Judi. Full 5 – Run back to the Knoll by leaving the parking lot, turning right on the LynnFells Parkway and keeping straight to Melrose High School. The Knoll water stop will be on your left. Full Finish – Finish up by running the last few hills along the LynnFells Parkway as you get yourself to Grimsby’s. Turn left on West Wyoming, then left on Main and stroll in to Brueggers. Sneakers! – You’re marathon or half in coming up. Check the soles of your shoes, they’re probably worn, you’ve been running a lot. This is a good time to buy a new pair of running shoes. This will either let you break in your race day shoes in time for the big day, or extend the life of those shoes you’ve grown to love over the past few months so they’re still usable on race day. Don’t wait until taper time to realize you need new shoes! Water Stops – I’m in, although I’ll want to run some of the run. Hank is in. Tom is in I believe. That should get us through the day. Last Week – We set off to Winchester for 20 miles and 10 miles, returning to the Victorian Fair in Melrose Center to finish. While only 5 people ran the full route in what has been a quiet season for marathoning, we had about 30 runners doing the half route. The weather was cool which led to a lot of upbeat runners stopping by the water stops. This Week – A recovery week for everyone, the mileage goes down 4 miles for the long runners, and down two for the half runners. We’ll be running up to Wakefield along Main Street. 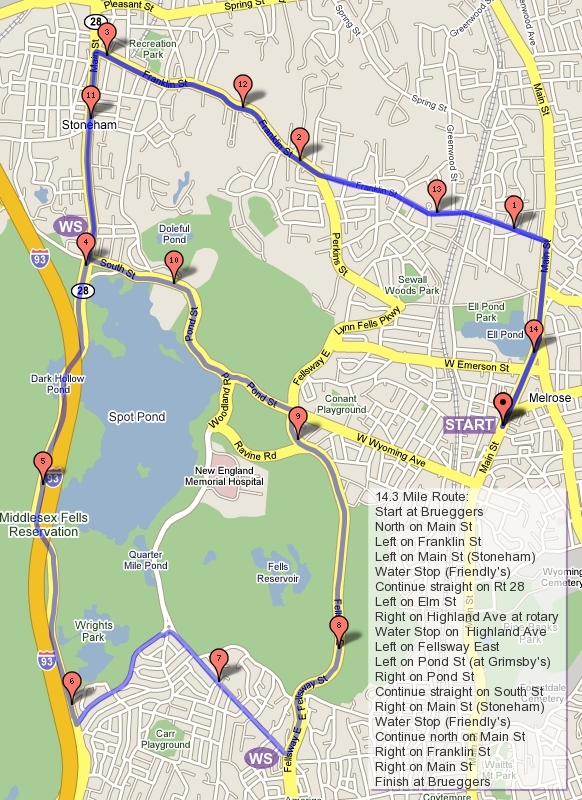 Full route runners will continue on to loop Lake Quannapowitt and then loop Breakheart. Half route runners will run up to the lake before turning back. I do suggest veteran half marathon runners consider adding on some miles to this run. Ramping up to 15 miles in the near future will make racing 13.1 feel just a little easier. The weather looks comfortable again, primed for another good training day. This week’s run will have multiple legs that all end at the Nick’s Pizza parking lot for water stops. Yes, you travel all around and the water stop stays in one spot. Start – Heading north on Main Street, we’ll pass Ell Pond, continuing on into Wakefield, and hitting the Nick’s Pizza parking lot at the corner of Nahant for a water stop. Half 2 – Both groups will head through Wakefield Center along Main Street, but half route runners will veer to the left onto Common Street and turning right on Church Street. Run to the set of lights at North Ave and turn left. North Ave will bring you back to Main Street at Jiffy Lube. Cross Main Street and get yourself another cup of water at the Nick’s Pizza water stop. Half Finish – The half route runners will then return to Melrose along Main Street the way they came. Full 2 – Full route runners will continue to follow Main Street after they pass through Wakefield Center, running along the east side of Lake Q. Turn left on Lowell Street at the end of Main Street, then another left on to Quannapowitt Way. Head along the path on the north side of the lake going over to North Ave where you’ll turn left. Follow North Ave all the way back to Main Street where you’ll cross over to the Nick’s Pizza water stop again. Full 3 – Next run along Nahant Street over to Wakefield High School. Head up Hemlock Street to the Northeast Technical Vocational School, through their parking lot to the Wakefield entrance to Breakheart. Go counterclockwise around the outer loop, staying right through the hills (Love the hills, they’ll love you back), past the headquarters, along the flat side, staying right at the beach, and back out at the Voc. Run back down Hemlock, crossing over to Nahant and back to Nick’s Pizza. Full Finish – From here, head back down Main Street to Brueggers to finish up! Water Stops – There is one water stop today, and likely four people helping out, so you’ll be well taken care of. Last Week – About 30 runners took on Breakheart on a comfortable weather day. Short route runners enjoyed a 9 mile trip through the Breakheart hills and back, with a little picnic bench water stop along the way. The few runners took on the 18 mile long route continued along a round about excursion through Wakefield, making their way to Lake Quannapowitt before heading home to Brueggers. This Week – We’ll take another adventure but this week will head out towards Winchester, with the long runners stretching into Medford and almost to Arlington. People training for a half will do 10 this week, while people aiming for Baystate will do 20. With the Victorian Fair going on, people have an option of starting early with a loop of their own to get back to Brueggers around 8AM. We’ll have some water outside if you need it. This will allow you to finish earlier to help volunteer for the EMARC Road Race. Short runners could run 3.5 miles before 8AM and skip the Eaton Street loop. Long runners, I suggest you just stick with the plan in order to hit the water stops at the right time, adjusting times will result in missing water stops. Start – Both groups will leave Brueggers at 8AM. Main Street will have workers busily nailing tents down, so we’ll stand in the middle of the street and set off south past Marathon Sports. Take a right onto West Wyoming and run past Grimsby’s up to Spot Pond. Turn right, pass the Stone Zoo, then pass Friendly’s, and continue past the onramp to I-93N. At the next set of lights turn left on Marble Street in Stoneham, run over I93 onto Forest Street in Winchester and stop at Eugene for a water stop. Half 2 – The half runners will continue on Forest Street to a turn onto Highland Ave, at the blue H sign for Winchester Hospital. Run past the hospital and move to the right side. You’ll come up to a little park at the corner of Eaton Street where you’ll turn right. At the bottom of Eaton you’ll turn right onto Washington Street. Follow that to the Gingerbread Construction Company where you’ll turn right back on to Forest Street. Run up, up, and up Forest Street back to Eugene for another water stop. Half Finish – Half runners will finish up the way they came. Run back over I93 to a set of lights. Turn right on Park Street and make your way past Friendly’s, straight past the Stone Zoo, and along Spot Pond. At Pond Street turn left down to Grimsby’s. Continue straight onto West Wyoming making your way to Main Street. Turn left on Main and back to Brueggers and the Victorian Fair. Grab a coffee and go volunteer to direct traffic at the corners of the race route! Full 2 – Full route runners will leave Eugene down Forest Street to the blue H sign for Winchester Hospital. A left there will get you on to Highland Ave. Follow Highland past the hospital, straight through a 5-way intersection all the way to the end. Look for a water stop on the left side. Full 3 – After your water stop turn left onto Main Street. This will become Winthrop Street in Medford. Move to the right side of the road and as you pass Oak Grove Cemetery turn right onto Playstead Rd. Follow Playstead to the end where you turn right on High St. There is a Dunkin Donuts that is very convenient for a bathroom break. Continue on High Street. There will be a litte fork where you need to stay left to stay on High Street. You’ll eventually come to a rotary at Mystic Valley Parkway. Turn right onto Mystic Valley Parkway… don’t go straight into Arlington! Run along the Mystic Lakes to what seems to be the end of Mystic Valley Parkway and turn right onto Bacon Street. Go past the commuter rail and cross to the left side and take a turn onto Mystic Valley Parkway (see, it wasn’t the end). As you run along Mystic Valley Parkway you’ll find a water stop on the right. Full 4 – Next continue on the Mystic Valley Parkway to a set of lights at Washington Street where’s you turn left. Follow Washington Street through a 5-way intersection, crossing Mt Vernon Street and bearing right to stay on Washington. This will eventually bring you to the Gingerbread Construction Company where you’ll turn right on Forest Street. Take Forest up, up, and up to Eugene for another water stop. Full 5 – Leave Eugene on Forest over I93 to a set of lights at Park Street. Turn right and run over to Friendly’s where you turn right. Follow the Fellsway West along the back side of Spot Pond, going over I93, past the Sheepfold, and under I93. At Elm Street you’ll turn left and make your way to the rotary at Highland Ave. Turn right into Highland and find the final water stop. Water Stops – Janet’s keeping Hank this weekend so it will be Tom and I. Lois has volunteered to help but she also wants to run. If anyone else can help, let me know. Last Week – We had a pleasant weather morning, and a pull back mileage week, leading to many happy faces at the water stops. Besides the hills, nobody had anything to complain about. There were only a handful of people training for a full marathon, but a lot of half runners as over 25 people ran from Brueggers to run some or all of the Melrose Law Enforcement Half Marathon route. This Week – We’ll be heading back to Breakheart, which used to be part of the Wakefield version of the Law Enforcement Half Marathon route. Short runners will be doing about 9 miles, training on some daunting hills, good strength training for those quads and a chance to learn how to pace through hills. The full route runners will also do these hills early in their 18 mile run. As the mileage increases in September you’ll find a few of our routes have early hills which trains your body to recover during a run as you cycle through to your second and third winds in a marathon. Start – Leaving Brueggers, head north up Main Street, past Ell Pond, crossing near Melrose Wakefield Hospital to merge right onto Green Street. Take a right at the lights at the intersection of Green St and the LynnFells Parkway. Follow the LynnFells to the Saugus entrance of Breakheart on the left side of the road. Turn left onto Forest Street which brings you up to the headquarters of Breakheart where you’ll find a water stop. Half/Full 2 – Everyone will circle Breakheart counterclockwise. For those that are clock challenged, that means enter Breakheart to the right following the outer loop. At the pond in Breakheart stay right to continue on the outer loop. Circle past the Wakefield entrance and through the hills to get back to the headquarters building and another water stop. Half 3 and Full 3 – Run back out the Saugus entrance of Breakheart turning right on the LynnFells Parkway. Half route runners will go back the way they came, continuing on the LynnFells to a left on Green Street. Merge back onto Main Street in Melrose and find your way to Brueggers to finish up. Full distance runners will follow the Wakefield Half route with a right turn at the first set of lights onto Main Street in Saugus. This will turn into Farm Street in Wakefield and bring you to Wakefield High School where you’ll find a water stop near the school entrance. Keep to the right here to get on Lowell Street. This will bring you up to Lake Quannapowitt. At the lake get to the left side of the road to turn left onto Quannapowitt Parkway to get into the Comverse parking lot. There will be a water stop in the lot somewhere. Full 5 – Leaving that water stop continue on Quannapowitt Parkway to North Ave and turn left. North Ave will take you to a set of lights at Church Street where you turn left. Church Street takes you to a church at Wakefield Common, turn right onto Common Street here. Common will merge onto Main Street and Main Street will take you to the intersection of Nahant and Main and North Ave. At Nick’s Pizza on the left side will be your final water stop. Full Finish – Now its a straight shot south along Main Street to get you back in to Melrose and back to Brueggers. 18 miles done! Water Stops – This one is challenging but I think I have Tom and Hank helping us all out. The three of us will be at the Breakheart Stop. Hank will move on to the Wakefield High stop, Tom will handle the Comverse stop, and I’ll be hanging at Nick’s to help you get home.